Famous People on our Doorstep - an occasional series by Pete Ford. Norman Cyril Jackson was born in Ealing, London on 8 April 1919. As a small child he was adopted by the Gunter family being educated at Archdeacon Cambridge and Twickenham Grammar School. After leaving school, having an interest in engineering he became a fitter and turner. On the out-break of war he volunteered to joined the RAFVR, enlisting in October 1939. He saw training at both halton and Hednesford and qualified as a Fitter 11 E (Engines) before being posted to Sierra Leone with 95 Squadron in January 1941. He was employed as an engine fitter in areo engines and marine craft with his newly formed unit, whose main objective was maritime reconnaissance, using Short Sunderland Flying Boats. An opportunity ten came up for him to “Re-muster” as aircrew and Jackson applied for training as a Flight Engineer, returning to England in September 1942. He spent his next six months at 27 Officer Training unit and then moved on to RAF St Athan, completing his training in March 1943. In June 1943 he was “re-mustered” as a Flight Engineer and on promotion to Sergeant, posted to No. 1645 Heavy Conversion Unit. At the end of July 1943 he joined No. 106 Squadron at Syerston (Lancasters) where he completed nine sorties. He then moved to RAF Metheringham in the November of that year. Sergeant Jackson had seen 29 sorties from RAF Metheringham, mainly with a regular crew, attacking industrial areas of Germany. He made a total of ten trips to the heavily defended target of them all, Berlin, but on his fifth such visit to the capital, in December 1943, his plane was attacked by fighter planes and limped home extensively damaged on three engines. In 1944 the War had entered a new phase with the Lancaster bombers generally employed in giving support to the France Landings but on the night of 26 April when conditions were favourable, an attack was earmarked for Schweinfurt, the home of the German ball-bearing industry. Despite having completed his “tour” and he and his wife Alma having just become the proud parents of a new son, Flight Sergeant Jackson intended staying with his own “crew” until they too had also completed their “tour of duties” and he volunteered for one more “just for luck.” Unfortunately his plane, along with four others, became the worst static of the War for RAF Metheringham from one operation as all five aircraft failed to return with the loss of 23 men and 12 becoming POW (including a seriously injured Jackson). At 21.35 hours Flying Officer Mifflen, D.E.C. took off in Lancaster ME669 Z-NO from R.A.F. Metheringham for the 1,000 mile round trip to Schweinfurt with the ‘Old Firm’, Flying Officer F.H. Higgins (Navigator), Flight Sergeants N.H. Johnson (Rear Gunner), E. Sandelands (Wireless Operator), M.H. Toft (Bomb Aimer), Sergeants W. Smith (Mid-Upper-Gunner) and Norman C. Jackson at the Flight Engineer’s instrument panel. Unexpected strong head winds delayed the main bomber force of 215 Lancasters’ en route and with the “pathfinding” aircraft inaccurately marking the target the German night fighters incessantly attacked the bombers with combats taking place all the way to the target and during the period of the raid. Despite this, bombs were dropped successfully and the aircraft climbed out of the target area but when at 20,000 feet and travelling at 200 mph, ME669 was attacked by one of these fighters. The captain immediately took evading action, but the enemy fighter secured numerous hits with a fire starting near a petrol tank on the upper surface of the starboard wing, between the fuselage and the inner engine. Sergeant Jackson had been thrown to the floor during this engagement and probably sustained wounds in the right leg and shoulder from shell splinters. Recovering himself Jackson suggested to his captain that he felt he could distinguish the fire. Pushing a hand fire-extinguisher into the top of his life-saving jacket and clipping on his parachute pack he climbed onto the navigation table and deliberately opened his parachute inside the aircraft, while Higgins and Toft sorted out the rigging lines and chute to prepare themselves as ‘anchor-men’. Sergeant Jackson jettisoned the escape hatch above the pilot’s head and then started to climb out of the cockpit into the freezing 200mph slipstream and back along the top of the fuselage to the starboard wing. Lowering himself until his feet met the wing root below he flung himself forward and managed to grasp the leading edge air intake. He directed the contents of the extinguisher into an engine cowling opening with the flames momentarily dying down but then the Lancaster was forced to bank to port to take further evasive action against the returning attack from the German fighter. This time the aircraft was raked with cannon fire again and for a second occasion Jackson was wounded. The impact of the shellfire saw Jackson lose grip on the extinguisher as the flames again erupted, blowing over Jackson’s body. Losing his grip he was swept off the wing but some how held in the slipstream by the smouldering rigging lines and canopy furiously being played out by Toft and Higgins before they lost hold of the parachute totally. Breaking free from the stricken Lancaster with his face, hand and clothes severely burning he began descended rapidly the 20,000 feet to earth, trying to extinguish both himself and the smouldering cords. Conscious of the pain from his back and leg wounds his hands had become totally numb and shrivelled by the flames but more pressing than the fact that his parachute canopy was ripped and shredded was the ominous burn holes which were getting larger and larger as he descended. On board the aircraft the Navigator, Flight Lieutenant Higgins, realising the fire was totally out of control, gave the order to abandon aircraft. Four of the remaining crew landed safely but Flying Officer Mifflin and Rear Gunner Johnson had perished. These survivors became prisoners of war. Somehow Sergeant Jackson’s decent to earth was miraculously cushioned by a mass of bushes but barely conscious he lay in a pitiful state with a broken ankle, his hand useless and his right eye closed through burns. At daybreak he managed to crawl to a cottage on the edge of the forest where an irate middle-aged German verbally abused him before two young girls took him in and nursed his wounds. Alerted by the cottage owner, some local Police officials appeared and Jackson, supported by one of them, was made to walk to the nearest town where he was parade through the streets of the town before being treated at the local hospital. Some people jeered and insulted him. Jackson then spent around ten months in hospital as he slowly recuperated from his injuries. He was then transferred to Dulag Luft, north west of Frankfurt, where he made two attempted escapes succeeding on the second one to meet up with U.S. troops from Patton’s Third Army near Munich. Sergeant Jackson’s astonishing experience did not become known until after the war when the members of the Lancaster’s crew were repatriated. Jackson had said nothing about his courage but the navigator, Flight Lieutenant F. Higgins, and the others unanimously recommended him for a high decoration. 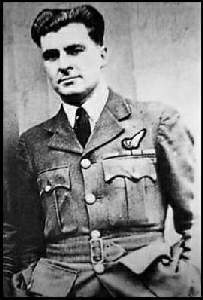 On 26 October 1945 Jackson, now a Warrant Officer, became the first flight engineer to be awarded the Victoria Cross. He was invested by King George VI at Buckingham Palace on 13 November 1945, together with Group Captain Leonard Cheshire who in his day was, both the youngest Group Captain in the service and, following his VC, the most decorated. Only nine Victoria Crosses were awarded to crew members of Lancasters, a record not achieved by any other aircraft.Warrant Officer Jackson left the RAF on a Disability Pension of £2 a week and despite the permanent handicap to his scared hands he worked as a Travelling Salesman. Having been adopted he became a passionate family man and a deeply religion person, never speaking of his Award. He died in March 1994 in his 75th year and is buried in Middlesex. The concise language of Jackson’s citation cannot truly give the whole picture of the actions of a gallant human being over sixty years ago in an attempt to save his colleagues and aircraft from the hand of the enemy. In reality when he left the cockpit of an aircraft travelling at 200 mph he had little chance of ever returning had he extinguished the fire and his self-sacrifice should never be forgotten.On 30 April 2004 Warrant Officer Jackson’s collection of Medals went for auction in London at an estimate valuation of £120,000 - £140,000.It eventually fetched £235,250, a world record price for a gallantry award. Most interesting, I am the nephew of the Navigator of Norm's aircraft, Frank L. Higgins, his wife my aunt Peggy was my father's sister. Am in regular contact with David Jackson, did you know that very soon there is to be a School extension named after Norman Jackson at Hampton Hill School. I am trying to trace a family member Barry J Raymond who was the son of Frederick Raymond, son of Frederick Samuel Raymond. Could the above Barry J Raymond please get in touch and let me know if he is the rifgt one? For the past 12yrs I have been doing a history project with the cadets of 1265 Horncastle Air Training Corps. Would it be possible for Barry J Raymond to get in touch with us so we can talk to him about his uncle. A well deserved award for such heroic deed. This page contains a single entry published on December 9, 2006 4:39 PM. Bogus Caller Initiative was the previous entry in this blog. The Village Cross, its History and what could happen to it!! is the next entry in this blog.